Preheat the grill and put the pepper quarters, skin-side up, under the grill. Once the skin has blackened and blistered, transfer to a bowl and cover. Once cool enough to handle, peel away the skin and cut the peppers into chunky dice. Meanwhile, warm the olive oil in a large frying pan over a medium heat and sauté the onions and garlic until soft. Peel away the sausage skin and crumble the meat into the onions. Fry until well coloured, then add the wine, herbs and lemon zest. Boil briskly for 5 minutes, then mix in the tomatoes and diced peppers. Simmer gently for 30 minutes, then add the olives and adjust the seasoning. Continue to simmer for a further 20 minutes. Meanwhile, bring a large pan of salted water to the boil. Just before the sauce is ready, drop the pappardelle into the boiling water. Cook for 2-3 minutes, until al dente. Drain and serve with the sauce. 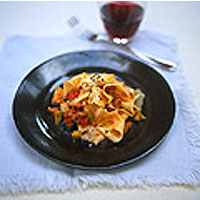 This recipe was first published in Fri Jun 01 01:00:00 BST 2001.